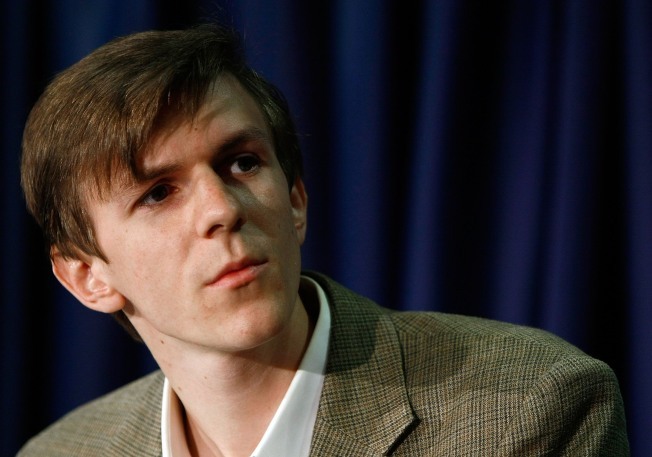 James O'Keefe is out on bail and scheduled to appear at a Commonwealth Club panel in San Francisco on February 1st. James O'Keefe, who rose to national prominence after a ham-handed "sting" posing as a pimp to investigate non-profit housing rights organization ACORN, will be in town next week speaking at a Commonwealth Club event. More recently, O'Keefe was arrested in connection with an alleged attempt to hack the phones in the New Orleans office of Louisiana Senator Mary Landrieu. It's not clear if he'll make the event -- though out on bail, Salt Lake City Republicans are looking for a replacement speaker for O'Keefe's scheduled appearance on Feb. 4. Moderating the discussion will be Josh Wolf, who was himself held in a federal jail after refusing to turn over unedited footage and identify subjects in a 2005 incident involving the injury of a San Francisco police officer which he caught on video tape. The event is planned to be a discussion on the "the benefits (and pitfalls) of undercover reporting," and certainly if anyone knows the pitfalls it would be O'Keefe and Wolf. Inspired to become a national media sensation yourself? Veteran undercover reporter Harmon Leonoffers some handy tips on how one might infiltrate the upcoming National Tea Party Convention in Nashville, Tennessee. Jackson West admits that, on occasion, he has been less than up front about being a reporter when trying to get some sensitive information over the phone.